One of my recent health goals has been to limit or avoid foods with added sugar and oils in any form. This presents quite the challenge when it comes to baked goods. I have baked with coconut oil, coconut sugar and brown rice syrup. I no longer buy the sugar or syrup and I don’t bake with coconut oil any more. I’ve been experimenting with oatmeal cookies. 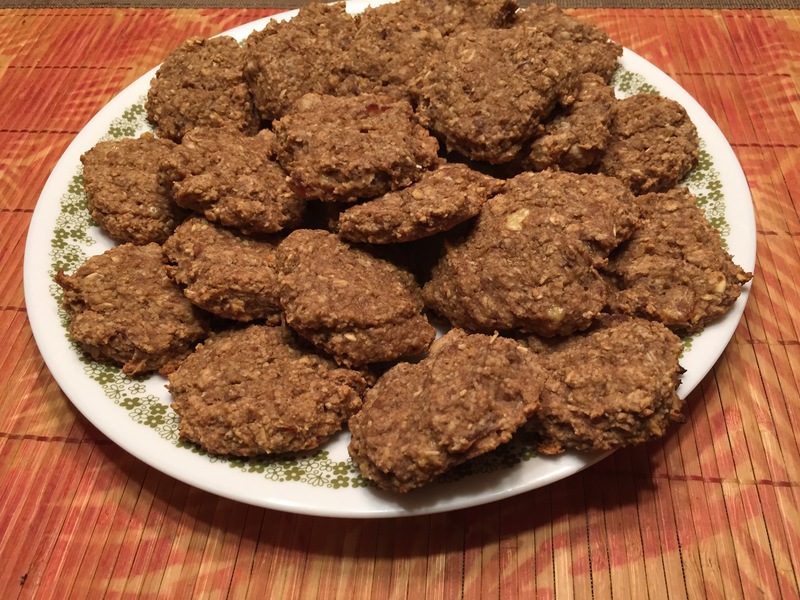 I was inspired by Larabars because they are one of the only snacks that are delicious and contain simple ingredients such as dates, nuts and dried fruit ONLY. I often enjoy the peanut butter cookie flavor. The ingredient list is dates, peanuts, sea salt. THAT’S IT! I tasked myself to make an oatmeal cookie version so that the fat content was lower. This was my third attempt. I may still tweak the ingredients a bit but I’m ready to share it with you. Soak dates in 1/2 cup water for 2-4 hours. Grind the rolled oats in a coffee grinder or food processor to make oat flour. Grind walnuts in food processor or grinder. Add ground oats to the flaxseed, nuts, baking powder, cinnamon, ginger, stevia and sea salt. Process bananas, dates and soaking water in a food processor. Mixture may be slightly chunky. Add vanilla to banana and date mixture. Add liquid mixture to oatmeal mixture and mix with a spoon until no oat flour is left dry. Place 1 1/2- 2 tbsp worth of mixture on baking sheet. Wet hands to prevent it sticking to your fingers. Press each ball to flatten to about 1/2 inch thickness.